Los Angeles, CA. Homemade Italian cuisine always gets my mouth watering. There is some truth to the idea of 'fresh is best' and experiencing that first-hand in various restaurants has certainly provided a new aspect for my food enjoyment. I have heard of this place through others and friends who have come here for years. Whenever I show them a picture of some of what I have enjoyed, a warm smile crosses their face and they remember that meatball or that pasta dish followed by the name of the person with whom they came. 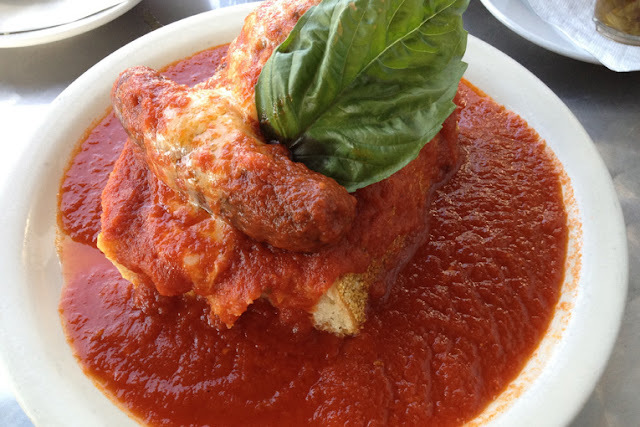 This little eatery has that little 'something' better understood with a helping of meatballs and marinara or an endless supply of warm bread. There is humility in the air and the aesthetic is simple: modest seating inside, a few chairs on the outside, an enticing display case of gelato, and familiar faces working behind the counters serving moderately priced Italian fare. The staff are friendly and some have worked there for quite some time. It's comforting to hear and see a waiter light up to their favorite food items and not simply because it's the seasonal special. Their menu covers the Italian basics but a few household favorites easily stick out when browsing the plates of fellow diners: bread + marinara + gelato. A noticeable difference than other venues is the lack of up-sell - if a customer suggests a dish that may cost a bit more to combine flavors of another dish, the server will be quite honest in how each dish is prepared and why such a mix may not be palatable, though it is ultimately up to the customer's discretion. The house-made bread is another perk, crunchy on the outside, soft on the inside, and served with olives and spicy peppers. It's difficult to not want an endless supply, but make room for the courses, because they are quite plentiful. Penne with Alfredo - with a wine base, this sauce takes on a different tone than one would expect for alfredo. It's mild, but tart, it's light, but with distinctive flavors. It may be easy to think of that heavy and creamy alfredo standard, but here it is an entirely new introduction. The pasta was cooked al dente and tossed in the alfredo sauce adding the light familiar cream with their unique take. I ate the entire heap (yes I said heap) of pasta, though it challenged my stomach to host the dish next to my bread and olives. Meatball and Sausage Sandwich - open-faced sandwiches have become a newer favorite, selfishly so as I came to realize that there seems to be a bit more filling served to balance out the absence of bread. Some melted cheese atop a giant meatball and sausage set on some housemade bread and saturated in marinara exudes savory. The giant meatball easily won out in its size and flavor blend with familiar but subtle italian spices paired with their sweet marina. The marina here is sweeter than one would expect and for some, perhaps too much, however it seems to be easy to fall in love with the sauce (as it seems to disappear quite quickly along with the food). The sausage was good, but not exemplary as sausages go, but enjoyable nonetheless in the dish. Amaretto Gelato - One of my favorite flavors in the world of gelato and one of my easier choices to make. I look and I look and I sample and I sample, but I'm left with only two choices: undecided on which flavor to try or Amaretto. It has become a bit easier to choose the latter when I have already been overwhelmed with choices in my meal selection. The flavors were delightfully creamy and held up well when plated and served. I preferred the in-house service of gelato and the generosity in the portion size I was able to enjoy. The familiar flavor warmed me up and cooled me down and none was left to share. This little Italian eatery could easily place itself in a smaller or larger community and still maintain the steady local following of pizza, pasta and gelato lovers. Some places simply keep their strength by focusing on the food and allowing the food to generate the experience. Food can, and memorably so, take a person on a journey of familiarity, enough so to lose conversations momentarily to the the sweet and succulent flavors permeating one's senses. Savoring the moment is quite permissible when it comes to cuisine that gives such a rush. I'm quite happy to have come across another such place. Another terrific post. Well-written, informative, beautiful pictures... literally makes one feel like we were having lunch with you. Thank you kindly! 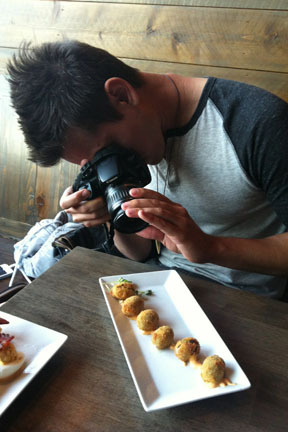 Food can be such a memorable experience and if I can share some of that experience through words and images, I will. Thanks for reading!